As the five-day parole granted to them by the Punjab government nears its end, former prime minister Nawaz Sharif, his daughter Maryam Nawaz and son-in-law are being taken back to Rawalpindi's Adiala jail to resume their sentences in the Avenfield apartments reference. 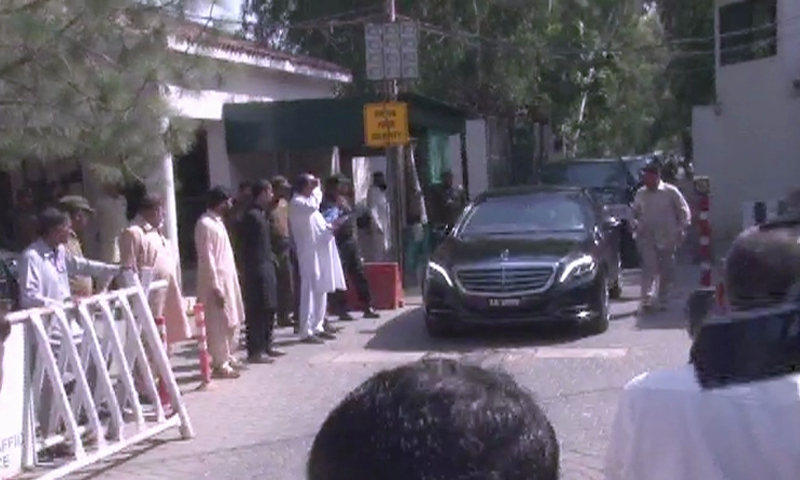 A convoy of cars carrying the trio left Jati Umra — the Sharif family residence in Lahore — for the old airport, where they were made to board a special plane for Islamabad, sources told DawnNewsTV. Upon landing in the capital, they will be taken to the prison. Sharif, Maryam and Safdar were released on parole last week after the death of three-time former first lady Begum Kulsoom Nawaz in London. The parole will end today at 4pm. Before leaving for the airport, the three visited the graves of Kulsoom, her father-in-law Mian Sharif and brother-in-law Abbas Sharif and offered fateha, DawnNewsTV reported. Begum Kulsoom had undergone several surgeries and chemotherapy treatment at a private hospital in London after being diagnosed with lymphoma in August 2017. She suffered a heart attack in mid-June and was put on a life-support machine. In the first week of August, her condition improved and she was taken off from the ventilator. However, her condition deteriorated again on Sept 9 and she breathed her last on Sept 11. Her sons Hassan Nawaz and Hussain Nawaz along with their uncle Shahbaz Sharif and other party leaders offered her funeral prayers in London before her body was shifted to Lahore. After her second funeral, which was attended by her husband, daughter and other relatives besides workers and leaders of various political parties, she was laid to rest near the graves of her father-in-law and brother-in-law at Jati Umra on Sept 14.